Lily Tomlin once quipped, “The road to success is always under construction.” I never imagined the road to my own personal success would be to go into Education. I never imagined it would lead me to become a Library Media Specialist. I never imagined the road taking me towards achieving a second Master’s Degree, this time in Educational Technology. There were a lot of things we envision for our future. I always found myself looking at the end of the trip, not the adventures along the way. That’s why Lily Tomlin’s quote resonates with me so much. When you stop to look at what’s going on along the way, not just the place you hope you end up, your life becomes more fulfilled and a greater sense of learning and accomplishment occurs. I always thought I was destined for the air. I loved airplanes and everything to do with aviation so when I graduated from high school, that’s what I pursued in college. It wasn’t until I was miserable five years later that I realized that the road I was following wasn’t the right one. Looking back now, there were many “signs” that it wasn’t the right path for me. I just didn’t know what I was seeing. I really didn’t know how to “see the signs” until I started working in education, in a roundabout way. I’d dress up in a tie-dyed lab coat and act all crazy about a scientific concept for whoever I could get to come to my presentations at the Pacific Science Center. It was at one of these presentations that I finally opened my eyes. After a presentation, a young boy about the age of three dragged his father up to the stage and then got shy, to which my father told me, “Hi. We loved your show and he wanted to tell you that his name is Adam.” The father and boy turned and left. After that, I was hooked. In the end, I would go on to return to North Dakota and enter into the Education program with hopes of becoming a Kindergarten teacher. It was after graduation and during my substitute teaching that I discovered the passion of literacy and libraries. From there, it was into the world of school libraries. Shortly before I graduated from the University of Wisconsin-Milwaukee with my Masters in Library and Information Sciences, I took a course on technology and the library. I learned about e-books and e-readers as well as Digital Storytelling and Web 2.0. I didn’t realize it then, but this course planted the seed to pursue what I’m now about to accomplish. In the end, the job of Library Media Specialist at Prairie Wind Elementary School brought me face-to-face with the future of my field. I was asked to check out books and teach technology. This was a great opportunity, but I had no idea what or how to accomplish this. I didn’t think it was enough that I put kids in front of computers. I think that, if a Librarian is to succeed in the way our society is heading, he (or she) must be greatly in-tune with where the students and society is leaning, not just in content or pedagogy, but in the tools they use. This is why I chose to pursue a Masters in Educational Technology. I have learned a lot, but I still have a lot to learn. I had thought when I started the program in CEP 810, Teaching for Understanding with Technology with Carolyn McCarthy and Jodi Spicer, that this might be just taking new approaches to old ideas, but it became very apparent that I was mistaken. Right away, Professor McCarthy challenged my way of thinking about the classroom and how my students approach the learning environment. I was introduced to the concepts of Dr. Koehler’s Technological Pedagogical Content Knowledge (TPACK) and the Flipped Classroom. TPACK would continue to follow me through the rest of my MAET track, so I knew I’d become far more acquainted with it than I did in CEP 810, but the “flipped” classroom really challenged me. I grew up believing that the teaching was done at school and reinforcement occurred at home (or wherever the student goes after school like daycare or wherever). I learned that I only thought I had an idea of what educational technology really was. CEP 810 set the table for my MAET experience. It taught me that there was more to technology education than just “being a computer teacher.” This course stressed the importance of flexibility and fun as part of the educating process. Technology is great and it is becoming more and more affordable every day, but “greatness” in education isn’t measured by how many pieces of technology students have at their fingertips. It isn’t measured by how flashy or feature-laden the content is either. “Greatness” in education rests more with how technology is utilized within the parameters of content and pedagogy to build a balanced, engaging, and effective learning environment. I did not know how to effectively harness this ideal then, but I’d soon grow further acquainted with this concept. 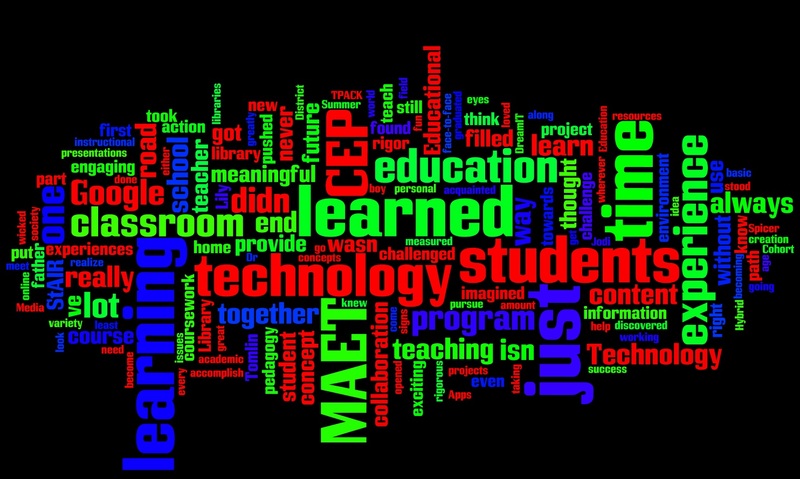 If CEP 810 opened my eyes to learning experiences being more than just education meeting technology, then CEP 811 (Adapting Innovative Technology to Education with Nancy Ayers and Jodi Spicer) really pushed the concept home. I was challenged with the concept of the Stand Alone Instructional Resource (StAIR) and I floundered initially. I wondered “Why are we doing this? If technology isn’t the teacher or the content, why do the StAIR at all?” I found that, through the process of creation, I could “teach without being seen.” The StAIR activity turned out to be a very meaningful experience because I learned that, through the creation of StAIR programs, I could provide a wide variety of engaging, instructional material to my students without having to spend a lot of time wasting their attention spans with boring lectures. Instead, I could promote learning in a number of facets of their academic environment at the same time while allowing them to learn at their own pace. The learner was more in charge of their learning and I could get a whole lot more done with my students in a limited amount of time. I learned, in the end, that technology is a bridge that helps bring pedagogy and content together in a cohesive, effective, and engaging manner. Through the initial three courses I took (Teaching for Understanding with Technology (CEP 810), Adapting Technology to Education (CEP 811), and Applying Educational Technology to Practice (CEP812)), I learned more and more about issues and concepts in Educational Technology and how to evaluate where I stood and where my classroom, in this case my library, stood with regards to the field. I knew that my students enjoyed exploring the internet but weren’t exactly sure how to use it correctly. When challenges arose with their traditional coursework, they’d either ask their teacher (or parent at home) or Google. The prevailing assumption where I worked, one that I took up until my MAET coursework led me towards investigation, is that Google was used because of general laziness of the student and had relatively little academic value in its existing format. This was the focus of my “wicked problem” in CEP 812, Applying Educational Technology to Practice. Through interviewing students, teaching some lessons, and exploration of available electronic resources my District offers, I learned that students were not such a product of laziness in finding the answers, they were more in search of convenience and ease of use. Whichever path provided the least resistance toward their goal, they’d take. This was true even if Google was not allowed in the classroom. Since the wicked project, I’ve investigated further and discovered that students didn’t always enjoy static information (like that found in a textbook). They liked to interact with the information. Websites gave them the feeling that they weren’t just gathering information; they were interacting with it and immersing themselves in it. I do not believe this path would have availed itself to me without what I’ve learned through my time in the Certificate portion of my MAET experience. During the summer of 2013, I participated in the intensive Summer Hybrid Cohort (CEP 800/815/822, courses entitled Learning in School and Other Settings, Technology and Leadership, and Approaches to Educational Research respectively) in East Lansing. I got to meet Dr. Punya Mishra for the first time and with the help of William Cain and Dr. Danah Henrickson, I got the most informative and exciting experience in the MAET program. This wasn’t just exciting because, for the first time, I got to put faces behind several of my classmates from previous courses, it was the first time I could put a face-to-face component to the entire MAET learning experience. This is important to me because I feel that one of the main downsides of online learning is the lack of personal contact with those who teach you and those you learn with (text is just text/video is just video. There’s part of the human psyche that craves in-person interaction). As I dug through my copious notes from the summer I noticed how filled, how rigorous, my learning was. I think that the state of education in my classroom requires the same amount of rigor, adjusted for age and developmental appropriateness. Downtime produces boredom and boredom eliminates learning and increases issues in areas such as retention, engagement, and especially classroom management. My MAET experience to this point, and pushed greatly by the Summer Hybrid Cohort, made me realize that rigor comes with action and action is the best part of education. It is this action that pushed me towards another revelation: collaboration is more than group projects at school. Collaboration can come anywhere. Online collaboration itself isn’t new to me, as my coursework was filled with it. I just never thought it was applicable at the elementary education level. I learned that using Google Docs, for example, could enable real-time or nearly real time collaboration between two people about a variety of topics related to their schooling, whether they are in the same class or on the other side of the Earth. It is a very basic realization but one I didn’t really internalize until writing my “DreamIT” project. Socializing is the wave of the future and online collaboration gives my students a vital pathway that is free to study together, complete projects together, learn together, and create together even when it is not possible for them to all meet in person. Sometimes it is the most basic or obvious realizations that provide the most meaningful and powerful messages. Now my time in the MAET program is winding down I look to what’s next. I’m still working on my DreamIT project, trying desperately to turn at least one of the “higher-ups” in my District into the advocate I need to unblock Google Apps. But even without Google Apps, I can use what I’ve learned and reflected upon in my Capstone Portfolio (CEP 807) course to guide where I’m going. I’ve learned that I still have a lot to learn. As I wrote in my Personal Growth Plan final reflection in CEP 811, I need to destabilize myself a bit more and expand my horizons beyond that of Microsoft or what few tools I had before joining the MAET program. I can provide motivation, rigor, and useful instructional resources to my students and my peers. 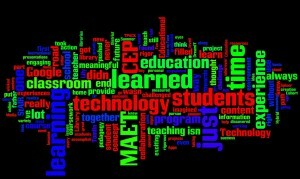 My time in the MAET program was filled with challenging, thought-provoking, fulfilling, fun, and meaningful experiences. I learned that there is more to teaching with technology than just teaching with computers or tablets. The challenge moving forward isn’t just to continue integrating new and exciting technologies into my classroom experience, it is to provide a rigorous, meaningful learning experience for each student that connects with each student every time he or she walks through the library’s door to help them prepare for a world ahead of them that no one can predict. Lily Tomlin was right. Construction of this road is ongoing and always changing. It’s a daunting challenge filled with hard work, trial and error, successes, and “learning experiences.” I’m ready for the challenge and excited for the future.